Tottenham have equalled a club record by going 12 Premier League games unbeaten after Harry Kane's two goals helped them comfortably beat West Ham. Kane scored for the fifth club game in a row to put Spurs ahead before Toby Alderweireld headed in from a corner. The England striker fired in his second after the break before Kyle Walker added a fourth for the home side, who also struck the woodwork twice. Manuel Lanzini's late goal was merely a consolation for the lacklustre Hammers. They had earlier hit the crossbar through Cheikhou Kouyate's acrobatic volley. The two sides began the day level on 21 points from 12 games - a tally that represents the Hammers' best start to a Premier League season - but it is Tottenham who now find themselves fifth - two points behind fourth-placed Arsenal. A month ago, Kane had one Spurs goal to his name from 13 matches in all competitions, following the 22-year-old's haul of 31 in 2014-15. He has dispelled any doubts by scoring in his past five matches for his club, accumulating eight goals in the process. 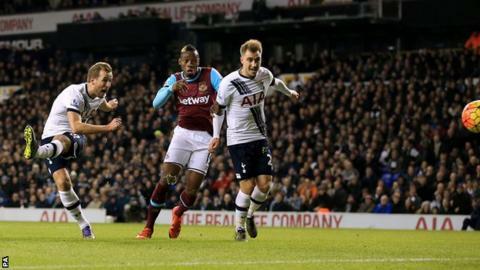 Kane's opening goal against West Ham was a typically ruthless close-range finish, following a sharp turn after the ball had fallen at his feet from Dele Alli's deflected long-range shot. His second came soon after the break from a well-struck shot from the edge of the box, although West Ham were also culpable courtesy of James Tomkins gifting the ball to Christian Eriksen in the build-up and Hammers' keeper Adrian allowing the shot to creep under his body. Kane could have been celebrating a hat-trick but for an awful miss near the end of the first half when he dragged a mis-hit shot well wide after being put through on goal by Alli. Full of confidence after scoring on his international debut for England against France on Tuesday, Tottenham midfielder Alli continued his fine form with another energetic and highly-effective display. He played a big part in Kane's opener and could have scored himself with a follow-up header that hit the bar after Adrian had saved a shot from Son Heung-min. The 19-year-old put in a box-to-box midfield display that saw him win tackles near the edge of his own box and often run beyond lone forward Kane in an attempt to make an impact in the Hammers' box. To underline Tottenham's current contribution to the national team, it was another of their England contingent, Walker, who scored their fourth goal - a neat finish with the outside of his boot following an exchange of passes with Son. Unfortunately for Spurs, they will have to cope without Alli in next Sunday's game against champions Chelsea after he picked up a fifth yellow card for tussling with West Ham's Mark Noble shortly before being substituted to a standing ovation. West Ham boss Slaven Bilic admitted before the game that his side faced a big challenge in covering for the absence of their "best player" Dimitri Payet, who has scored five goals and assisted three others since joining in the summer but faces three months out with an ankle injury. They failed in this mission at White Hart Lane. The only time they really threatened the Tottenham goal while they were still in the game was when Kouyate benefitted from a lax piece of officiating to acrobatically volley an effort against the crossbar from an offside position. Lanzini's goal, while a fine finish into the roof of the net from a tight angle after being set up by Nikica Jelavic, was way too little, much too late. Prior to that, Andy Carroll was a willing runner for the visitors, but he was largely left stranded in his lone forward role as West Ham fell to their second defeat in 10 games. The only positive for the Hammers was a late run-out for midfielder Alex Song, making his first appearance of the season after recovering from ankle surgery. Tottenham manager Mauricio Pochettino: "I am very pleased with the performance and with the players. Congratulations to them. It was an amazing show and I feel very proud. We all feel very proud. "The most important thing is that the players believe in the way we play and we share the same philosophy. Today was a big step forward because it was a very good example of how we want to play, and how we want to play in the future. "I think it is one of the best performances and results this season. It was a fantastic game. But the next game is always the challenge. Our objective is step by step. We are still very young and need to improve but it is important to keep the same mentality." West Ham manager Slaven Bilic: "The performance matches the result. They were better than us. "We just couldn't produce on the pitch. They were more a team. They were physically quicker and stronger and better in transitions. We played a really bad game but they played a really good game and we have to give some credit for this. "They wanted it more today than in a normal game, but we simply were not good enough to get anything out of that game." Spurs have lost just two of their past 20 Premier League home matches (W12 D6 L2). Kyle Walker scored his first Premier League goal for Tottenham since December 2013 (v Manchester United). Tottenham recorded 12 shots on target v West Ham United; no side has managed more in a Premier League game this term. West Ham have conceded four goals away from home for the first time since December 2013 (v Liverpool). Tottenham travel to Azerbaijan to face FK Qarabag in the Europa League. Spurs top Group J with seven points, one ahead of second-placed Monaco. Qarabag are bottom with four points. West Ham's next game is in the Premier League, next Saturday against 12th-placed West Brom at Upton Park. Match ends, Tottenham Hotspur 4, West Ham United 1. Second Half ends, Tottenham Hotspur 4, West Ham United 1. Corner, Tottenham Hotspur. Conceded by Winston Reid. Substitution, Tottenham Hotspur. Tom Carroll replaces Harry Kane. Ryan Mason (Tottenham Hotspur) hits the right post with a right footed shot from outside the box. Assisted by Christian Eriksen. Goal! Tottenham Hotspur 4, West Ham United 1. Manuel Lanzini (West Ham United) left footed shot from the left side of the box to the top left corner. Assisted by Nikica Jelavic. Substitution, Tottenham Hotspur. Josh Onomah replaces Son Heung-Min. Goal! Tottenham Hotspur 4, West Ham United 0. Kyle Walker (Tottenham Hotspur) right footed shot from the centre of the box to the bottom left corner. Assisted by Son Heung-Min. Attempt saved. Ryan Mason (Tottenham Hotspur) right footed shot from the centre of the box is saved in the centre of the goal. Carl Jenkinson (West Ham United) wins a free kick in the defensive half. Diafra Sakho (West Ham United) is shown the yellow card. Kyle Walker (Tottenham Hotspur) is shown the yellow card. Attempt saved. Winston Reid (West Ham United) header from the centre of the box is saved in the centre of the goal. Assisted by Mauro Zárate with a cross. Corner, West Ham United. Conceded by Toby Alderweireld. Attempt blocked. Manuel Lanzini (West Ham United) left footed shot from outside the box is blocked. Assisted by Cheikhou Kouyaté. Attempt saved. Harry Kane (Tottenham Hotspur) right footed shot from outside the box is saved in the centre of the goal. Assisted by Danny Rose. Offside, West Ham United. James Tomkins tries a through ball, but Nikica Jelavic is caught offside. Offside, Tottenham Hotspur. Mousa Dembélé tries a through ball, but Dele Alli is caught offside. Corner, West Ham United. Conceded by Danny Rose. Substitution, West Ham United. Nikica Jelavic replaces Andy Carroll. Substitution, West Ham United. Mauro Zárate replaces Victor Moses. Offside, Tottenham Hotspur. Kyle Walker tries a through ball, but Son Heung-Min is caught offside. Attempt missed. Harry Kane (Tottenham Hotspur) right footed shot from the left side of the box is high and wide to the right. Assisted by Mousa Dembélé.